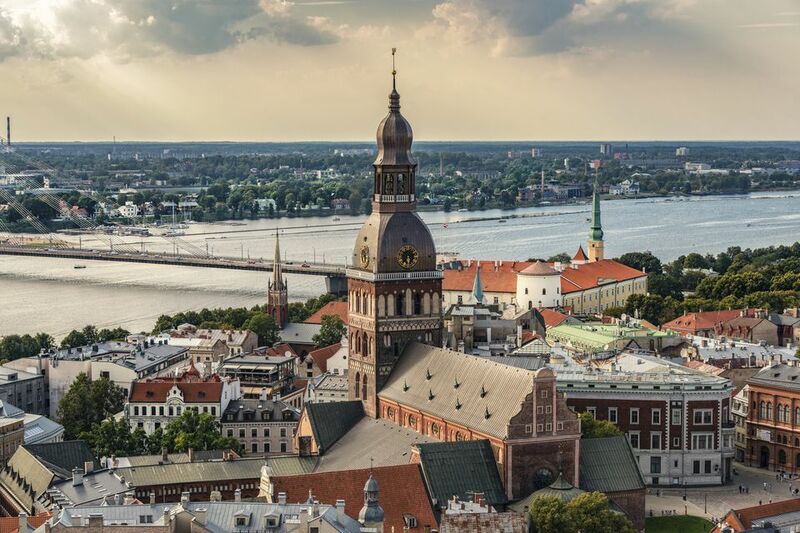 Often, travelers who want to see one Baltic capital extend their visit to include the other two due to the cities’ proximity and ease of access. Lithuania, Latvia, and Estonia lie nestled together on the Baltic Sea and their capital cities are easily reached by public transportation, such a train or bus. For example, the Simple and Lux Express line connect the cities in the Baltics. Tallinn is tantalizing in its contradictions. Well-preserved medieval fortifications surround an old town that wears its former trading might as a mantle of architecture and stories. Old Town Tallinn is more than medieval beauty, however. Wi-Fi is readily available in all of Tallinn, and its nightlife is fully modern. If you’re looking for locally produced souvenirs from Estonia, Tallinn doesn’t disappoint. Artisan shops selling handicrafts and jewelry are found along its main drags or hidden within courtyards. Wool products, wooden kitchen utensils, leatherwork, and even chocolate are produced by hand by local craftspeople. Estonia also manufacturers alcoholic beverages including the thickly sweet Vana Tallinn, a liqueur that can be drunk straight, as an addition to coffee, or in a cocktail. Tallinn’s restaurants range from cozy cellar affairs serving up sauerkraut and sausages to upscale restaurants where a premium is placed on service, wine menus to impress, and the food is presented with sophistication. Riga sprawls from its old town into an art nouveau district and beyond. Those who spend time in Riga will find that no matter how carefully they plan, it may not be possible to see it all. Old Town Riga is a tiny section of the city, but it holds a wealth of sights, as well as restaurants, bars, and clubs. Beyond Old Town is the art nouveau district with its stately buildings in pastel shades guarded by fanciful angels, partially clothed caryatids, or stylized vines. An art nouveau museum shows how residences of that time were furnished. Riga is well-known as a city that welcomes stag parties and students, so visitors won’t want for nightlife here. Beer bars, wine bars, and cocktail bars are prevalent, depending upon your preferences and budget. Visitors should also try the Riga Black Balsam, a black liqueur that some people love and others hate. Vilnius is the least touristy of the Baltic capital cities. Unlike Tallinn and Riga, Vilnius was not a part of the Hanseatic League. However, Old Town Vilnius, one of the largest and best-preserved in Europe, is a mixture of various architectural styles, from the reconstructed Gediminas Castle Tower to the neo-classical Vilnius Cathedral and Town Hall. It’s possible to spend all of your travel time in Old Town and still not see everything. Vilnius is an excellent place to buy amber, which washes up on the Baltic shore and is polished and mounted into almost fantastical jewelry creations. Linen and ceramics are also popular souvenirs, with Lithuania’s artisans using traditional techniques to create functional and beautiful items that suit a contemporary lifestyle. Lithuania is proud of its beer, so cozy pubs serving national beer brands or microbrews are popular. Vilnius is also home to several bars specializing in wine. Restaurants serving Lithuanian food, with its emphasis on potatoes, pork, and beets, are easy to find in Old Town, but international cuisines, such as Central Asian and Eastern European cuisines also find a home here. Whether you choose to visit one of the Baltic capital cities or all three, you'll find them unique with respect to each other as well as other capital cities in the region. What and Where is Jutland?